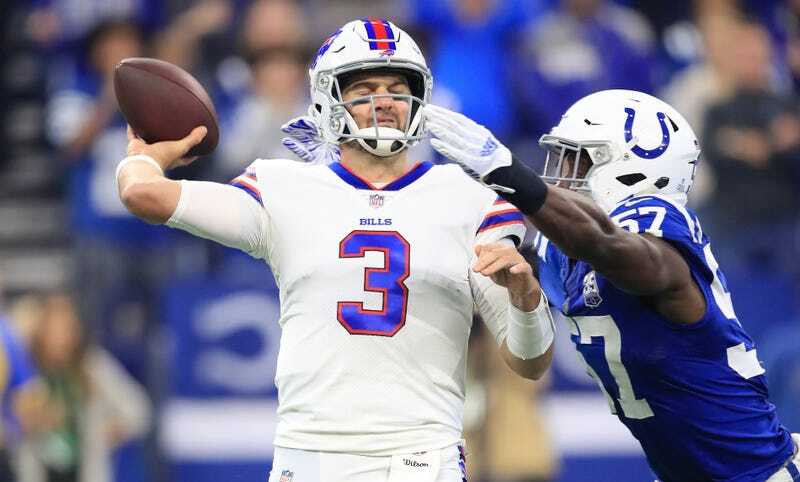 Bills quarterback Nathan Peterman was so dreadful last week, the team had to bench him for 35-year-old Derek Anderson, who hadn’t started a game since 2016 but was the only remaining healthy QB on the roster, for Sunday’s contest against the Colts. Ah, but therein lies a conundrum: When Derek Anderson starts and is bad, and the only other option is Nathan Peterman, who is also bad, to whom do the Bills turn next? Head coach Sean McDermott chose to let it ride with Anderson for the whole game, and Anderson rewarded him appropriately. Anderson did not play like the quarterback he was with the 2007 Browns for their surprising 10-6 season, because that was over a decade ago and all he’s done since is grow older. He threw for 175 yards with three interceptions and lost a fumble as the Colts trounced Buffalo, 37-5. Yeah, five: a field goal and a safety in the third quarter. That was it. After reflecting on yesterday’s loss and considering Josh Allen’s injury, McDermott decided today that the Bills would run it back with Anderson, this time on Monday night against the Patriots.